Android phones are more and more popular among fashionable groups, like Google Nexus phone, HTC, Samsung, Huawei, Xiaomi etc. According to the latest report, the collective recent sales of all Google Android phones exceed those of the iPhone in the US for the first time. But it only supports H.263, H.264 AVC, MPEG-4 SP video formats. So what if to play videos in other formats, like FLV, M2TS, AVI, MOV, MPEG and more? To solve this problem, some people turn to third-party video converter to convert these incompatible video formats to correct formats, and then transfer to Android phones. But the long-time conversion process relatively taxes their patience. Other people go to Android market and download mobile video player software for playing videos. Different video player supports different video formats. Hence, not all videos can be played by a single player. However, faddists always prefer to a more simple and practical method. Now they are using Air Playit, the latest video streaming software for Android, to remotely watch any videos which are stored in their PC or Mac. Air Playit is a powerful and free video streaming software for Android phone that is capable of streaming almost all videos from PC or Mac to Android phones via WiFi, 3G, 4G network. When meeting incompatible videos, it will live convert and stream video to Android-approved video formats. Thus, you can remotely and instantly play any videos on Android phone without third-party video converter and other mobile video player software. This free video streaming software is composed by Air Playit Server and App Client. This server should be installed on PC or Mac, and mainly for setting "Shared Folder", live or offline "Conversion" and streaming videos. The App Client is installed on Android phone and used for remotely playing video or movie on Android phones. Guide of Streaming Video to Android Phone via WiFi, 3G, 4G Networks. For wirelessly streaming audio video to android phone, you need video streaming software for android phone. 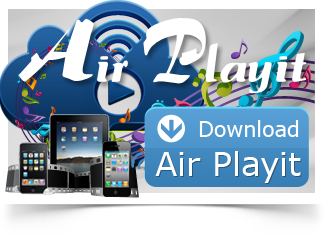 Please go to www.airplayit.com to download the server. Choose the right version between Windows and Mac based on your computer. The download information for Android client is also shown thereon. 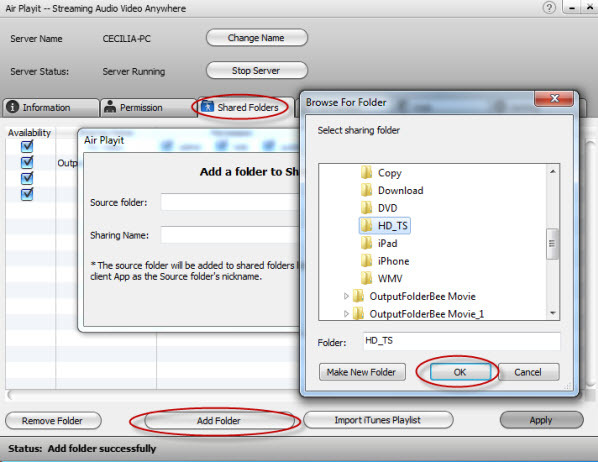 Step 1: Run Air Playit Server on your computer or Mac, click "Shared Folders" and choose "Add Folder" on the bottom to add any video folder from your computer for streaming. Step 2: Run the Client on your Android phone. Air Playit does fairly a good job in detecting local network by Bonjour Server. It also allows for manual IP address specifying. Click "+" button on the top to specify server address manually. Step 3: Find the video on your phone, and then click on it and play. Play M2TS/MTS on Android? Air Playit helps you streaming M2TS/MTS to Android without video format conversion. Free download the Android App. Share your HD Camcorder recorded M2TS/MTS video with friends on Android. It is a trouble to convert the video and movie before transmitting them to Android phone. Thus, Android phone user are taking much effort in finding a new way of playing video and movie, now, Air Playit just caters to your needs.